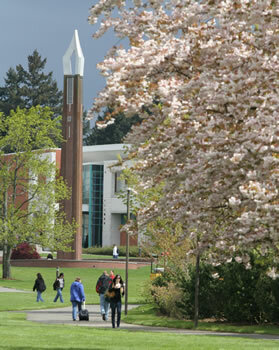 VANCOUVER, Wash. — Since they were planted in 1990, the cherry trees at Clark College have brought beauty and the symbolism of international friendship to the college and the community. 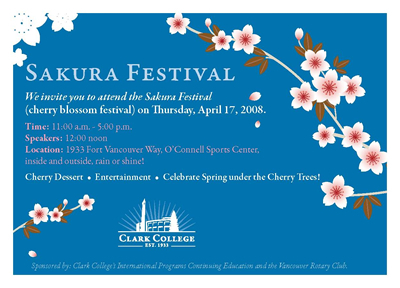 On Thursday, April 17, to celebrate the breathtaking cherry blossoms that bloom each spring, Clark College will host its third annual “Sakura Festival.” The Sakura Festival is sponsored by Clark College’s International and Continuing Education programs, in partnership with the downtown Vancouver Rotary Club. The event, which is free and open to the public, will take place from 11 a.m. to 5 p.m. Clark College is located at 1933 Fort Vancouver Way, Vancouver. From 11 a.m. to noon, students from Clark College and regional high schools, who will have just returned from Joyo, Japan, will lead a discussion and slide show presentation about their travels. That presentation will take place in the Penguin Student Lounge, located in the Penguin Union Building. 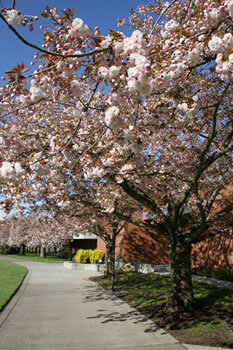 At noon, the festivities will move to the historic cherry trees near the newly-remodeled O’Connell Sports Center. Officials representing the college, the downtown Vancouver Rotary Club and the City of Vancouver are expected to take part in a brief program. Scheduled guests include Vancouver Mayor Royce Pollard; former Vancouver Mayor Bruce Hagensen; Akio Egawa, Consul General of the Portland Japanese Consulate; and Tatsuo Ito, Executive Vice President, SEH America Inc.
From 2-5 p.m., the Clark College Mature Learning program will present Akira Kurasowa’s “The Seven Samurai” as part of its “Classic Movie Series.” The film will be presented in Foster Hall Auditorium. On Earth Day 1990, a gift of 100 Shirofugen cherry trees from John Kageyama, President of America Kotobuki, was presented to the City of Vancouver to commemorate the 100th anniversary of Washington’s statehood. 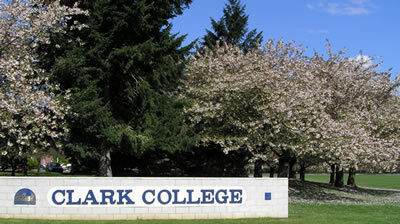 The trees were planted on Clark College’s main campus in Vancouver’s Central Park.